In a new report, released today, global analyst powerhouse IDC forecasts that the market for sound recognition (beyond just speech and music) technology in connected consumer devices will reach $1.2bn in licensing revenue by 2021, which represents an average market penetration across multiple device types of 14.3%. This means that the total addressable market for sound recognition licensing will be $6.5bn in 2021. The report can be downloaded for free here. IDC estimates that there were 1.7bn connected devices in 2016 and this will grow to 2.5bn in 2021. Although smartphone shipments will remain large their compound annual growth rate will be just 3% over the forecast period. Instead, IDC forecasts exceptionally high growth rates for smart speakers, smart home devices, connected cars, hearables and wearables, which will represent the largest opportunity over the next three years. In a special report, commissioned by Audio Analytic, IDC’s research director, Francisco Jeronimo looked at the drivers behind the adoption of AI in consumer electronics, why sound recognition is important in AI, and the opportunities and applications presented by sound recognition. The 12-page report, which can be downloaded for free from our website, looks at the applications for sound recognition in home security, care, pet care, transportation, entertainment, wellness and wellbeing and social environments. The author also explores the opportunity across the key device types, which will be audio-enabled: smartphones, hearables, wearables, smart home devices, smart speakers and connected cars. 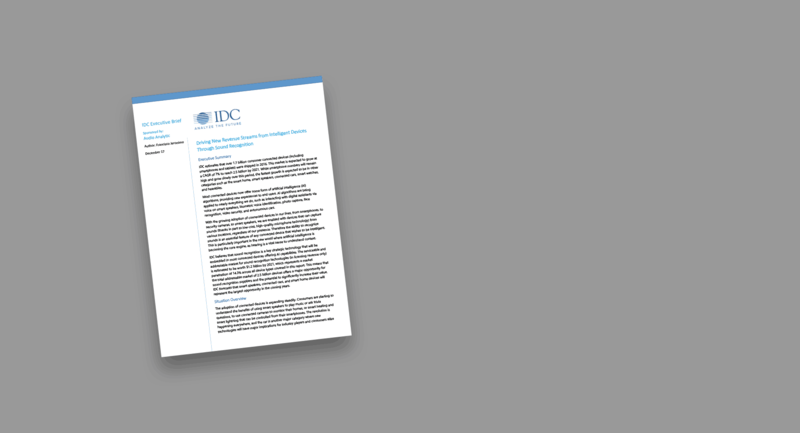 To download a complimentary copy of the IDC report, click here.